It would be easy to get bogged down on the details. The diet (raw whole prey for us), the various supplements, the massage/chiro (depending on the dog), the awareness and attention to fitness, and the somewhat obsessive attention to morale and subtle physical signs. But never mind those things. What I’m thinking about is not the way I pull together details together to support the activities, but the way the activities support us. Even when they seem overwhelming and the goals seem very, very far away. Frequent visitors to my blog have heard me mention Jean-Luc Picardigan. He was brain-injured at birth and grew up with neurological issues best described as autism. I got him from my friend Jennifer Roberson (Cheysuli Cardigans) when he was 10mo old, and the journey from there to here took many of his latent symptoms and blew them into insanity. He was an obsessive compulsive eater of things, he had no body or facial expression, he started fights because of his unrelenting bug-eyed stare, he turned to wood if you touched him, he had no ability to process verbal input. He certainly had very little idea where his body was in space at any given time. I got good at that. But then something clicked. Jean-Luc suddenly began to process things. And then there he was, finishing courses—and winning ribbons. And earning titles. I did retire him early, at which point his incredibly literal self became a schoolmaster for others. But by then, unless you noticed his very slightly lopsided head or his subtle freezes or the way I quietly managed him, you wouldn’t know how he started. No one did, unless I mentioned it. 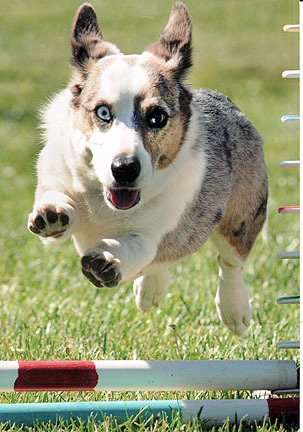 Agility did that for him. Agility kept Belle Cardigan whole, too. She was on the front end of becoming Lifetime #2 Preferred Cardi when she went down in the back—a congenital disk calcification disease. She was partly paralyzed and wasn’t expected to run again. Of course, you all know that she did, because she did end up as #2 Lifetime of that year. My vet said he’d never seen such a recovery. Of course, she got massage, and an exacting combination of supplements, and meds, and what would become, over time, a recovery protocol for flares. Agility has done the same for Connery–both with his health issues and his attack recovery issues. The training has helped him to overcome. The activity allows me to monitor his well-being more closely than I ever could without that give and take, that daily awareness of minutia in responsiveness and movement. And Dart–! My golly, that dog needs a job so badly he vibrates with it. Performance training has given him tools to deal with his over-stimulating world, no matter that we’ll always be a work in progress. And then, of course, there’s me. Activity is a fine line for me, and sometimes I walk it (though more often I fall off the side of “too much”). Still, too much is better than too little. In a world of Sensory Integration Disorder exacerbated by the neurological effects of long-undiagnosed Lyme, I need to move. And I need activities that ground me, and sometimes I need activities to keep me going at all. The other effects of Lyme mean I need to stay fit, but that I don’t tolerate exercise very well. 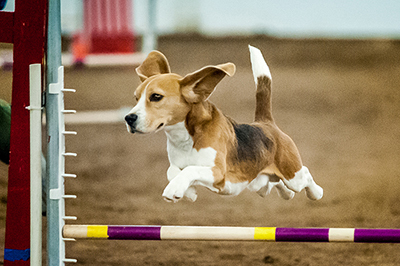 The need to be there for the dogs in agility has motivated many a brainstorming to overcome developing physical issues so I can keep going. Like I said, a fine line. But training and trialing the dogs helps me walk that line. I think it does the same for all of us, actually, humans and dogs alike. It might be more pronounced or specific for those of us who are managing specific challenges, but all the same…it’s not about participating in the sports in spite of these issues, it’s about participating in the sport because of what it does for these issues. 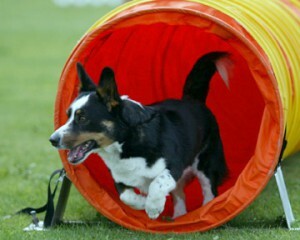 This post has been part of the Dog Agility “Health & Happiness” Blog Event for March. Lot of other people are chatting about it, too.